Our Fluffy Pals sticker design template makes it easy to print custom stickers for your pet-related business, animal charity, or special event. If you’re a veterinarian, pet groomer, pet boarder, pet photographer, or work for an animal charity, Fluffy Pals stickers will draw the attention of potential customers or donors. Fluffy Pals is available in three different soft color schemes, two shapes, and three distinct edge finishes. 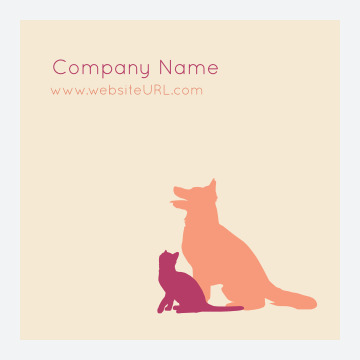 This design template features a dog and cat graphic on a solid color background with space above for your company name, website URL, or whatever custom text you want. Personalize and print stickers with our online design tool today! Personalize stickers for your business or organization with our online sticker maker, which lets you print custom stickers that will get you noticed. First pick your favorite template from our online template library, then choose your shape, edge finish, and a color scheme that will accentuate your brand. Personalize your design by adding your company or organization name and other text information you’d like to include. Your creation is ready to print in just minutes! You can even download a free PDF to share with colleagues and get invaluable feedback before you print. PsPrint uses only premium sticker paper stock and high-quality printing processes on state-of-the art- presses to ensure that your end product meets your expectations. And, your stickers are backed by our 100% customer satisfaction guarantee, making PsPrint your number one choice as online printing partner! Consider saving your design to import into other marketing products that you can also create with PsPrint, such as business cards, flyers, or postcards. Or, start from scratch and come up with something new to complement your stickers. Our custom printing team is on standby to lend any needed assistance to make your ideas turn into reality and effectively promote your business, organization or special event.